Most people think of Paris as the city of romance: walking along the Seine hand in hand with the one you love; sitting in little bistros gazing lovingly into each other’s eyes whilst drinking fine French wine and dining on haute cuisine; and sharing the moments when you feast your eyes upon impressive monuments and ogle at great works of art. Well, all of that’s true and many of us have done it, so why would you ever think of ruining this by taking children to this hub of sophistication and culture? Surely children aren’t going to get it? Well actually yes they are and a trip to Paris can be an amazing experience as proved recently by one of my clients Justine. With a love of Paris and a passion for its culture, Justine was eager for her girls to share her passion and to experience the wealth of culture the city has to offer. I worked with Justine to select the right hotel: central, interconnecting rooms and very importantly, a pool for the girls to burn off any excess energy before dinner, whilst the parents relaxed on loungers robed in hotel dressing gowns with a newspaper in hand (and an eye of the girls of course) - well, it is a holiday after all! Once the hotel was selected I provided the family with a guide on child friendly places to visit and ideas on where to eat. Then armed with their helpful hints, mummy, daddy and the 3 girls (2 twins aged 8 and a 2 year old) headed off for 3 nights of culture and fun. Although the area around this landmark is noisy and quite touristy, this is in stark contrast to the serenity and sublime beauty at the top. A hit with the girls was the coin machine which exchanges Euros for a specially printed coin - this apparently was very good for Show Time at school. As most people in Paris live in an apartment they take their parks seriously and they don’t get much better than the Jardin de Luxembourg. This is one of the largest parks in Paris and is very beautiful; it’s jam packed with activities for children. There are daily marionette shows, a classic carousel, a pond where you can float a rented toy boat and a children’s playground suitable for all ages - there’s a small fee but, you won’t mind when you see how clean and well maintained it is with safety flooring, sand pits, and an impressive array of play equipment. The park also has a great shop, café and there’s plenty of people watching to be had whilst the children paly safely. If the weather’s good take a picnic and plan to spend a few hours there. If you want to flood your children with culture and impress the teachers when you get home, this is the place to do it. However, tackling a museum of this size with children requires careful planning and a willingness to skip over some of the stuff on offer for the sake of keeping the children happy. There’s a wide ranging programme of children’s activities as well as thematic trails specifically for little ones. En-route, take in the squares that surround the Louvre which areawash with live music and street performers which will captivate the children. Don’t try and do too much: Take a good visitors guide and each night over dinner plan a maximum of one or two things to do the next day - let the kids get involved in what you’re planning to do by flicking through the pictures etc. Take the Batobus: This water taxi is a fun way to ride up and down the Seine, stopping off at the must-see sights such as the Louvre, Notre Dame and the Eiffel Tower. A 2 day family ticket is very reasonable and allows you to get on and off as much as you like. It’s a relaxing and pretty quick way to get around and the children will love being on the water; plus, you get to see Paris from a different angle. Stay local in the evenings for dinner: Everyone is pretty tired and you want to be able to walk back to your hotel afterwards. Also, use the Concierge - they are a wealth of knowledge on local child friendly restaurants and will gladly make dinner reservations. Give your French a try, however rusty: If you make an effort to try to speak a bit of French and visit places that the locals go to, you’ll soon discover that the Parisians are actually a friendly lot and only too willing to look after you and your children, even in some quite high brow restaurants. The trip you take to Paris en famille will certainly be different to the one you take with just the love of your life. 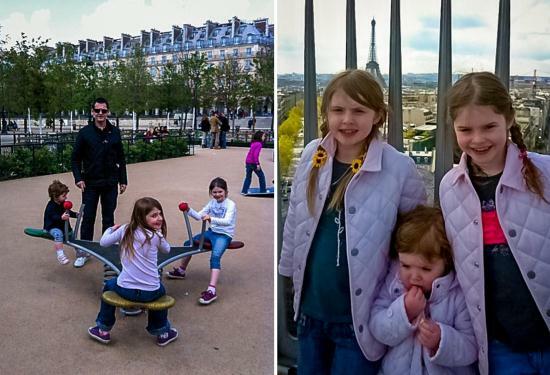 But being with children will make you see Paris through fresh and different eyes and will leave the children with lots of very memorable experience; it did for Justine’s girls who excitedly recounted stories from the trip when they returned to school. If a family trip to Paris sounds for you, or you’re thinking of a different kind of trip en famille, please contact me - I can plan your perfect itinerary and ensure that you have a stress free and totally wonderful trip. Special thanks to Justine for her input on this Blog.